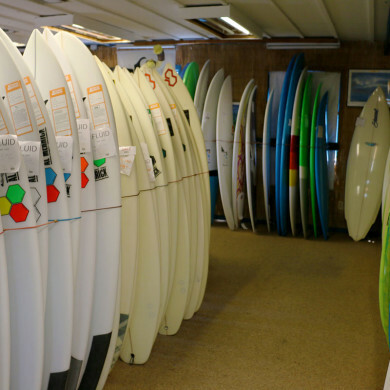 Fluid Surf Shop was born of its owners’ pure and simple desire to keep surfing. That was 1999, when the original store took over the Surf Report and brought Fluid to life. Always striving to be the “surfer’s choice,” Fluid eventually moved to the Miracle Strip Parkway. Carr says it has become a real ‘mom and pop shop,’ with the whole family helping out where they can. Carr, who has called Fort Walton Beach home since 1971, says surfing is the first thing he did when he moved here. Once of his favorite things to do on ‘flat days’ is get up early and take a walk along the beach, snapping photos to post to the Fluid Instagram and Facebook pages. But aside from a keen eye for capturing the beauty of the coast, Carr and his staff are great at what they do both in and out of the store. Fluid employs some talented surf and stand up paddleboard (SUP) instructors, offering lessons to locals and visitors to the area. Locals can attend “surf practice” each Saturday during the summer, and visitors can book private lessons for groups of up to three people. With a rousing motto – “To the beach!” – Fluid staffers can be heard encouraging their riders to take it all the way to the beach on each ride. In fact, Carr guarantees you’ll be surfing before your lesson is done. Fluid’s philosophy is simple: they want you to fall in love with surfing and let it change your life. The man locals call the “Surf Technician” also offers advice to make the most of your time on our beach. To learn more or book your lesson today, visit their website or call (850) 244-3554. For a 24-hour Surf Report, call (850) 244-0876.